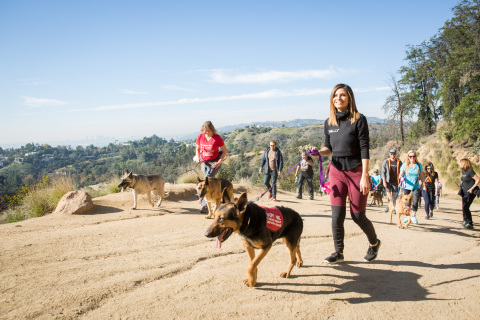 LOS ANGELES--(BUSINESS WIRE)--Today, TV/radio personality Maria Menounos and digital health company Rally HealthSM teamed up with Westside German Shepherd Rescue to host a dog walk in Griffith Park in Los Angeles to promote healthy living and the health benefits of pet ownership. The 1.5-mile walk started with Menounos, a Rally Health Ambassador, addressing participants about the fitness and emotional benefits of having a dog. She also talked about how her own dogs helped her through her health challenges in 2017. “Today was a fun and heartwarming event. It is such a gift to be able to help others by sharing the story of my health journey, which includes my dogs. They bring me so much joy and ensure that I get exercise every single day. I’m grateful to them for that and wish the same for other people,” said Menounos. The event was co-sponsored by Westside German Shepherd Rescue, a no-kill animal rescue nonprofit in Los Angeles dedicated to finding permanent and loving homes for German Shepherds and other dogs. “Our Rally team, including Maria, was thrilled to be able host this special event. It’s our goal to help people live healthier lives, and we know that pet ownership can make a big contribution to that,” said Brenda Yang, SVP, Rally Health. Rally Health, Inc. is a consumer-centric digital health company that makes it easy for individuals to take charge of their health and collaborates with health plans, care providers, and employers to engage consumers. The company’s flagship offering is Rally®, a digital health platform featuring a suite of Web and mobile solutions that help people manage their health and health care needs. More than 45 million consumers have access to the Rally platform through more than 200,000 employers, and payers such as UnitedHealthcare, BlueCross BlueShield of South Carolina, Health Alliance, and others. With offices in Washington, D.C., San Francisco, Chicago, Minneapolis, Denver, and Las Vegas, the team behind Rally HealthSM has been working together since 2010 to transform the consumer health industry. For more information, please visit www.RallyHealth.com.